The following post by Sean Carleton and Julia Smith was originally featured on December 18, 2014. By mid-December, the holiday shopping season is usually in full swing for Canadian retailers. Thirty years ago, however, several Eaton’s department stores in southern Ontario were experiencing a different type of holiday hustle and bustle: Eaton’s workers were on strike. Hoping that unionization would improve their wages and working conditions, many of the department stores’ mostly female workers had joined the Retail, Wholesale and Department Store Union (RWDSU); but management’s refusal to negotiate left them with few options but to withdraw their labour power. On 30 November 1984 RWDSU members at six Eaton’s locations went on strike. In doing so, they embarked on a significant struggle to win a collective agreement in a sector known for poor pay and precarity, all while enduring one of the coldest winters in Canadian history. Eaton’s workers picketed for almost six months. During that time, they used a variety of tactics to maintain morale and hold the line. 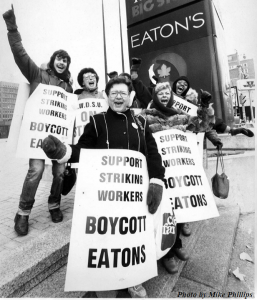 With help from the Canadian Labour Congress, they organized a national boycott of Eaton’s, a particularly effective technique during the holiday shopping season. Strikers also used performance and humour to win public support. In the lead-up to Christmas, they worked with the Red Berets, a feminist musical group in Toronto, to adapt Christmas carols to incorporate issues related to the strike. These types of creative tactics attracted considerable media attention and thereby increased public awareness of and support for the strike.